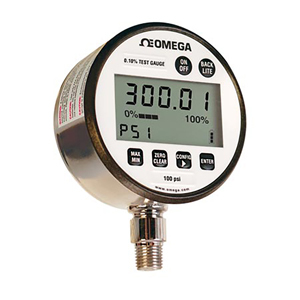 The DPG7000 Series comprises high-accuracy digital test gauges designed for the most demanding applications. These gauges feature a 0.05% total error band, which includes linearity, hysteresis, repeatability, and temperature effects from -18 to 66°C (0 to 150°F). The all stainless steel wetted parts and case carry a NEMA 4 (IP65) rating. A variety of user-configurable options—including languages, update rate, dampening, backlight, and auto-off—greatly increase the DPG7000’s versatility. All units include a stainless steel protective cover and carrying case. A 10-point individual calibration chart is standard with 0.05% accuracy units. Backlight: Five Options; on/off, 10 sec., 30 sec., 1 min., 5 min. 注: All DPG7000 series gauges include 300 series SS protective cover, protective carrying pouch, batteries and operator’s manual. DPG7000 0.05% units also include NIST-Traceable calibration certificate. To order DPG7010 or DPG7025 units with optional NIST-traceable calibration certificate, add suffix "-NIST" to model number, and add $175 to price.